Shot up to the Blue Mountains yesterday for a spot of waterfall shooting given the weather was perfectly overcast with drizzle. (would have liked a little bit less drizzle). This one is taken at Horseshoe Falls in Hazelbrook. I have been playing around with a soft mist / glow effect in Photoshop which seams to work well. I think the shot would have benefited from an over exposed shot blended into some of the shadows. Maybe next time. 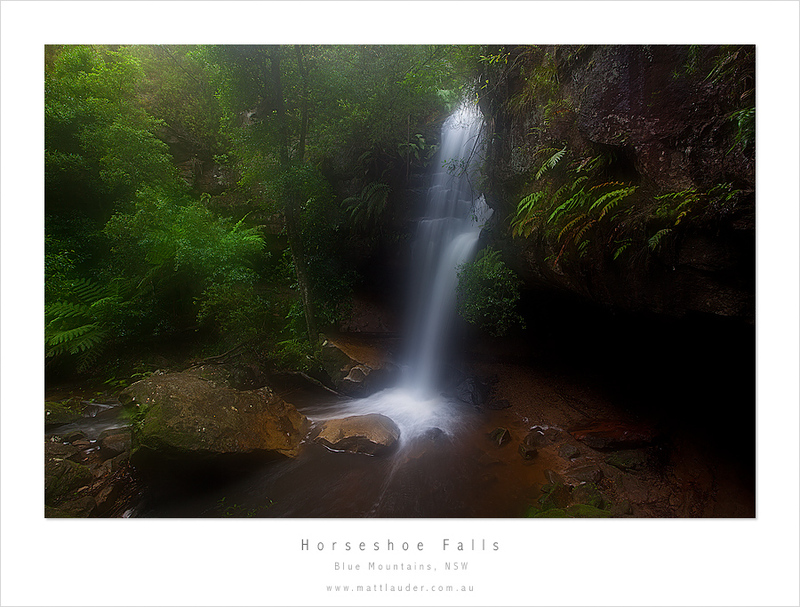 This entry was posted in Uncategorized and tagged Blue Mountains, hazelbrook, horseshoe falls, matt lauder, Photography, rubbing pixels, soft glow effect, Waterfalls. Bookmark the permalink. I love the light you’ve caught on the waterfall! Thanks… had to do a few things to hold back the green from going fluro with the processing. The lighting was great. and there was me thinking that all the leeches in our area had decamped off to Somersby…. Never had a leach on me at Somersby Barney…. thanks for the heads up, now I will be paranoid when I go there next… Haha. Worst thing is once you get them off your foot you have to get them off or fingers as they latch on so quickly. hehe – and last time I was up in the Mountains I never saw any either.. bugger, they’re getting everywhere. Yes, leech count was three last time at Somersby (again in drizzle weather, for good shots) one on calf inside jeans, found at time, two down socks when i returned to the car to dry out. yuk Yuk YUK!!!!! I’m taking a 35mm film container with salt in it next time i go. Give ’em a feed. I don’t mind the darkness being pure black, it adds some nice contrast to the image, Matt. Well done with the soft light effect, too. Loving your recent stuff, keep it coming! Thanks Beau. Appreciate the comment. I don’t mind the darkness either. Yesterday was the perfect day for waterfall shots – nice one mate. Nice work with the misty feel – kind of gives the shot an ethereal quality. Yea yesterday was perfect. Got a few shot ruined from water droplets on the lens. Massive amount of water flow at some places. Lovely shot – blocked shadows are just fine in my opinion, since we all know that the woods are dark even on a sunny day. Very dreamy and evocative, nice job! Thanks Mitch…. haven’t seen Neils shot but I am guessing there are a few ways to do it. As long as the technique can also be used on an image for printing and not just to look good online then it’s a good technique. did you make a *out in the field* tutorial? Very mystical look about it! Woa! 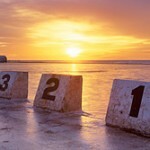 New” Peter Lik” ! New” Inner Peace”. Thanks mate… yea might be a bit under from the processing. Hard to balance the light and dark with these kind of images certainly didn’t want it to look to light. It’s growing me Matt I like the feel now!!! It’s something you have to look at a couple of time I think??? next time it rains we should head up…. take some salt to feed the leaches though.